There seems to be a consensus that a wet starter (i.e. 100% hydration) favors growth of lactic acid bacteria (LAB) which in turn produce acids. The low pH after 2 days in my starter suggests plenty of LAB activity, so the main challenge for me was to get the yeast growing. Considering the fact that the yeasts found in sourdoughs prefer areob conditions for growth, I should have whisked in more air with each addition of water. And I wonder if this is the origin of the widespread myth that you “catch wild yeasts from the air”. I’m quite sure whisking helps, but what you do is not to catch yeast, but rather feed oxygen to your starter. This needs testing though! 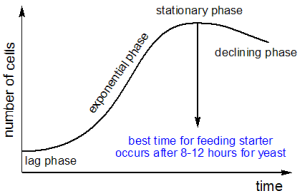 Most starter recipes call for discarding of half or even more of the starter before each feeding. Even though it seems wasteful I wonder if an important effect of this is to dilute the acid produced by the LAB (the flour may also act as a buffer). This acid will to some extent slow the growth of yeasts (even though the sourdough yeasts are far more acid tolerant than the conventional brewer/baker’s yeast Saccharomyces cerevisia). 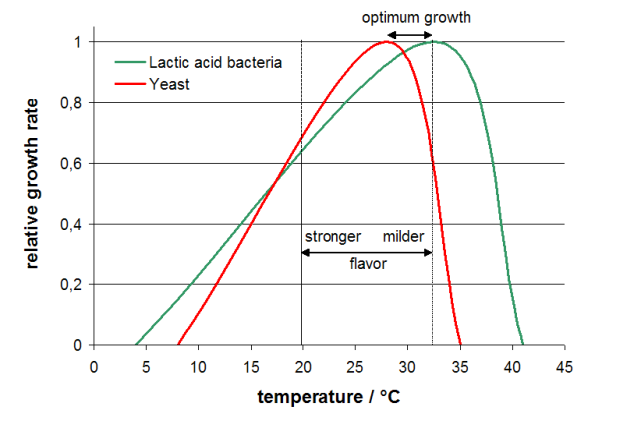 Regarding temperature the growth optimum for LAB lies around 32-33 °C whereas the growth optimum for yeast is somewhat lower at 28 °C. The sourdough FAQ has further temperature recommendations which are illustarted in the graph below (data from sourdough FAQ). Holding this together with the notion (see for instance p. 272 in “The handbook of dough fermentations”) that lower temperatures (20-25 °C) favor acetic acid production (= stronger flavor) and higher temperature (> 32 °C) favors lactic acid production (= milder flavor) it immediately becomes clear why a starter kept at roomtemperature has little yeast activity and smells of acetic acid. It need not be ruined, but is desperately in need of dilution, aeration and higher temperature. * for instance 300 g rye whole grain, 200 g rye fine, 300 g whole grain wheat and then plain all-purpose wheat flour up to 1417 g.
Mix water and flour mixed until all flour is wetted. 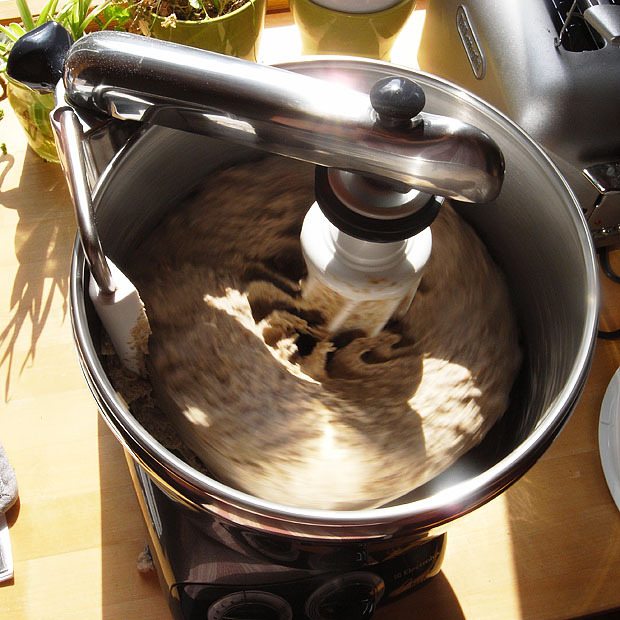 Leave for 15-20 minutes (during which the autolyse proceeds – this eases subsequent mixing). Mix (see more comments below regarding method/machine for this) until dough is smooth, and while mixer is running add sour dough starter. Once the starter has been properly incorporated into the dough, add the salt. Cover and leave to rise until volume has increased 30-100% (I know – this is not very accurate…). I have left it in on my bench top, but while this worked well on warm August days, it seems to be less than ideal on colder October days. Leaving the dough to rise on top of the fridge might be a conventient compromise here as my current waterbath is not large enough to hold the mixing bowl with dough. The reason I use a starter with a 67% hydration is that I can be more sloppy when adding the starter to the sourdough as it will not change the hydration of the dough. After proofing and slashing I bake the breads on a baking stone which is preheated to 250 °C. Right beneath the baking stone I have a small oven proof dish that I fill with boiling water. This helps to moisten the air in the oven and it simulates the steam injection port of professional baking ovens. There are several reasons why this is important. Moist air is a better heat conductor than dry air, and it prevents the surface from drying out too early while baking, resulting in a better oven spring. Furthermore the moist air condenses on the cold surface of the dough which improves gelatinization of the starch. This in turn gives better crust formation. After 10 min at 250 °C I open the oven to let the moisture out, take out the dish with water, turn the heat down to 220 °C and close the oven door. I bake the breads to a core temperature of about 93-95 °C. Here I bake two 800 g loaves on a baking stone. 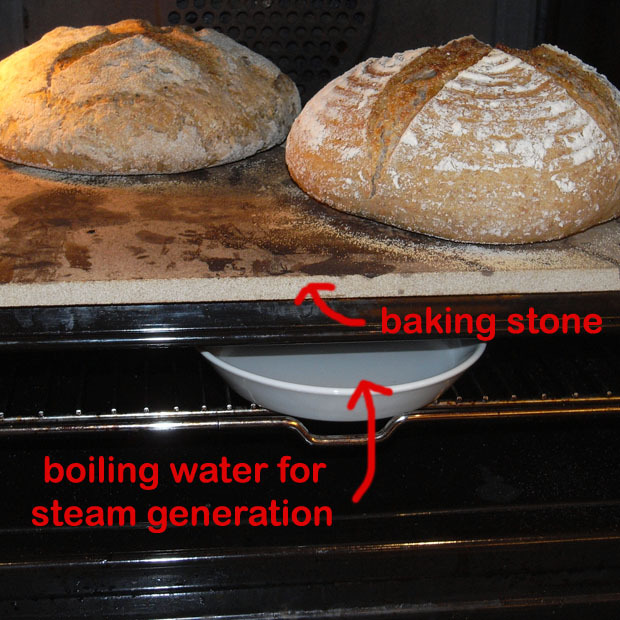 Notice the dish with water for steam generation. I should comment on mixing. When kneading by hand I’ve had a tendency to add to much flour. In fact I think this is one of the reasons why I quit baking bread several years ago – I found that the breads I made generally were a little to dry with a poor crumb, and at that time I didn’t really sit down and think about these matters. In retrospect however there’s no doubt that baking bread and adding flour ad lib until the dough feels good to touch is NOT recommended. Well anayway not unless you stop adding flour while the dough is still quite sticky. The thing about doughs with a high percentage rye is that they are quite sticky, and they should be. This is the best argument you’ll ever get for buying a kitchen gadget: bread doughs are too sticky to be kneaded by hand! There you have it! I’ve settled with the Assistent from Sweden. It was formerly sold under the Electrolux brand, but is now marketed indepentendly, yet it is still produced at the very same factory as always. In the US the machine is known as the Magic Mill. It has a huge 7 L bowl that rotates. The roller is attached to a flexible arm, so if the dough is to hard to work the arm just moves to the middle of the bowl. This significantly reduces the chances of overheating the motor. There are of course other alternatives from Kitchen Aid, Hamilton Beach and Viking Range which seem robust, but I have no experience with these. However, I doubt that the average Kenwood can cope with more than 3 kg of bread dough (but please correct me if I’m wrong :)). I’ve read quite a bit about sourdoughs, and what I’ve been looking for a simple correlation between temperature, hydration and fermentation time. An excellent source of information with lots of practical advice is the FAQ from rec.food.sourdough. I think the best resource I’ve found sofar is Lorenz and Bruemmer’s chapter “Preferments and Sourdoughs for German Breads” and Teija-Tuula Valjakka, Heikki Kerojoki and Kati Katina’s chapter “Sourdough Bread in Finland and Eastern Europe” in “The handbook of dough fermentations”. I will have to study these more carefuly. …temperature has no significant effect, and that fructose is more efficient in influencing the FQ than dough yield. The production of acids depends also on other things such as fermentation temperature, time and dough yield. Optimum temperatures for the growth of lactobacilli are 30-40 °C depending on strain (Stanier et al. 1987) and for yeasts 25-27 °C. 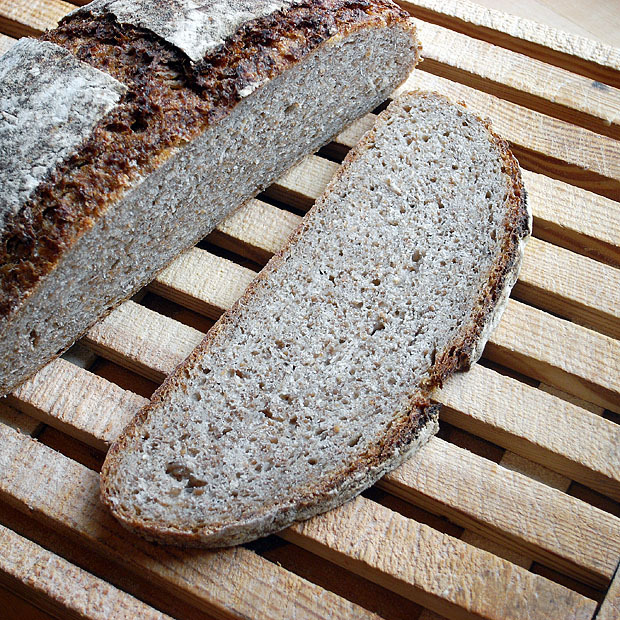 In general, a higher temperature, a higher water content of sourdough and the utilisation of wholemeal flour enhances the production of acids in wheat sourdoughs (Brummer and Lorenz 1991, Lorenz and Brummer 2003). I must admit that I’m a little confused as some of these snippets seem to contradict. It might be that I’m overlooking something important though and that I’m taking results out of their context. Any insight from my readers on this will be greatly appreciated! Here’s the details from my notebook on how I fed my sourdough starter. As I mentioned above, I wonder if discarding dough in the process actually does make sense after all. I show my raw data to illustrate that it’s not straightforward, even with temperature control. A fool proof starter – is it possible? What I’m hoping to achieve can be summarized as follows: A “fool proof”, robust and quick method to obtain a sourdough starter that’s as simple as possible, using only flour and water (possibly with addition of some fruit) without having to waste anything of the starter. Temperature is maintained using a thermostated water bath. Preferably it should be possible to adjust the fermentation quotient (ratio of lactic acid/acetic acid) and the total titrable acid content by means of temperature, time and hydration/dough yield. I think when people talk about yeasts in sourdough, they often times mean both yeast and lactic acid bacteria. Lay people don’t usually understand the difference. Using that definition, you can indeed catch them from the air. I have started many cultures from scratch (not using starter). Granted, I didn’t use sterile flour, but bacteria and yeast are everywhere. I think a lot of the old recipes for beer used wild yeasts, bock for one, if i recall correctly. I keep my sourdough in the fridge, and feed it sporadically. It’s never failed me. Though now it tends to smell like bananas sometimes. I’d love to make it so it would do that consistently, but I think that would take a tiny bit of genetic engineering. Hi my name is alex and i am a chef living in las vegas in the us i was wondering where you bought your Magic Mill i so far only found it on your amazon link and was wondering what store you bought yours at. At 27 lb shipping is not a thing i want to pay. Alex: Living in Norway I got my from a Norwegian internet shop – I guess it won’t help you much in the US. The yeasts, when in an aeróbic media multiply themselves, and in an anaeróbic media they produce the methabolites ethanol and CO2. That is the reazon for whipping. – If the four acts as a buffer, what components in the flour might do so? The aroma is pretty close to a traditional German “Bauernbrot”. The crumb is soft, yet it slices very well so you can easily obtain thin slices without everything falling apart. The bread also keeps well, i.e. it doesn’t get to hard/dry upon storage. Regarding dilution: I’ve also been pondering on this – could it be that yeasts multiply faster than the LAB, but that the LAB are so effective at producing acid that it halts the yeast multiplication. If this is the case, for every dilution the yeast/LAB ratio should change in favor of yeast. Does this reasoning make sense? 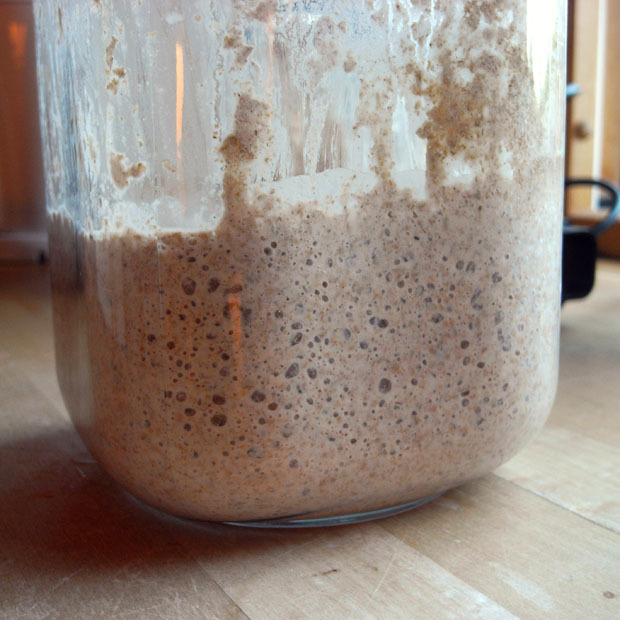 I am researching the science behind sourdough fermentation. So call me sourdough experience stupid right now. My guess would be controlling PH. “Both the yeast and lactobacilli are inhibited by the acid produced” The yeast will die eventually. Being a beer brewer I have a guess on the banana smell. In brewing beer an ester can be a desirable thing giving a certain beer a positive character. It could be an ‘ester’ formation that comes from some kind of acid reacting to alcohol. expanding my guess, storing in the frig for long periods and not refreshing more often could be allowing these esters to form. I have not made sourdough yet as I have to need to learn the science before I bake something like this, I liken the development or fermentation of the dough to making home made cultured buttermilk, which I have made a lot of. The fermentation method is identical. In with some of the old (growing culture) to make way for some new. It was explained to me by a professor that what you are doing with making cultured buttermilk (lactic acid) is ‘purifying’ the culture. Going from simple sour milk to something drinkable. This is what I have come to conclude so far with fermenting dough to make sourdough. It goes through a purification process. If you leave the buttermilk culture in the fridge long enough, it goes bad. Where the difference would be, yeast makes alcohol that known to a brewer when mixed with certain acids, forms esters – smells and flavors. also slowly gettin thru ur hydrocolloid recipe.. ups and downs but fun all the way.